Bob Rowland is a leading expert on pig viruses and oversees the North American PRRS Symposium in Chicago every year. Photo courtesy of Kansas State University. 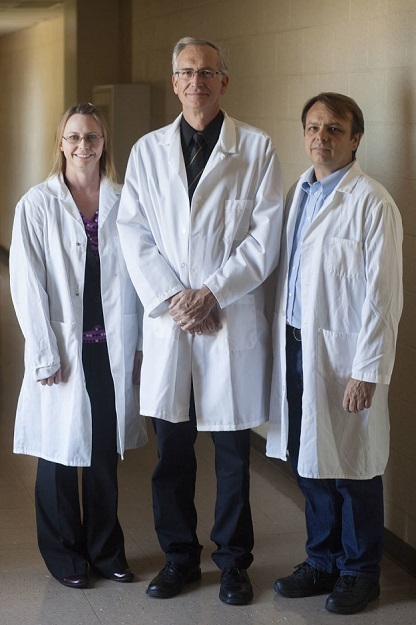 A research team led by the trio of (from left to right) Kristin Whitworth, Randall Prather and Kevin Wells has been able to accelerate their overall work through the CRISPR/Cas9 system. Photo courtesy of Mizzou News Bureau. his is a story about two phone calls and two accomplished researchers being equally surprised by the news coming from the other. The first call came in 2011 when Randall Prather — a pig geneticist and Curators professor in reproductive physiology in the Division of Animal Sciences in the University of Missouri’s College of Agriculture, Food and Natural Resources — placed a cold call to Bob Rowland, a pig virus expert who serves as a virologist and professor of diagnostic medicine and pathobiology at Kansas State University’s College of Veterinary Medicine. Up until that point, the two had never spoken to each other, although they both were aware of each other’s work in their respective fields. Prather, who has two degrees from KSU as coincidence would have it, had a proposition for Rowland: Take a sampling of genetically modified pigs from Prather’s laboratory that have had the cluster of differentiation (CD) no. 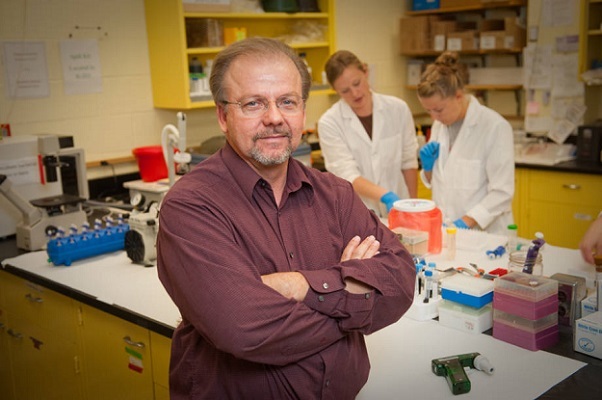 169 sialoadhesin molecule knocked out of their genetic code and challenge them with Porcine Reproductive and Respiratory Syndrome (PRRS) virus and see if they get sick, using Rowland’s specialized facility located 245 miles west of the MU campus. To Rowland, it sounded like the best opportunity to finally slay a dragon of a virus that has accounted for approximately $10 billion in losses for the pork industry in the last 20 years in the U.S. alone. “He already has the infrastructure to do exactly what I wanted done with these pigs, so I called him up and he said ‘Sure, I’d love to,’” Prather said. Based on the previous research, the CD 169 molecule was thought to have been the entry mediator to the white blood cells in the lungs, where the disease would cause such maladies as an inability to reproduce, small size and a high mortality rate. It was not, but it lead to the second phone call four years later this past March. This time Prather picked up his phone and heard an excitable Rowland, who was on vacation relaxing on a beach in Florida before talking to the technicians at his lab about the ear tag numbers of three pigs. It turned out that the trio were all pigs that had the CD 163 molecule knocked out of their genetic code at Prather’s lab during a research project that was funded through British-based biotechnology company Genus plc. They exhibited no signs or evidence or being infected with PRRS after being challenged with the virus. The study is being published in Nature Biotechnology this month.